When Batman first launched onto the television scene back in the 1960s, it had already amassed a cult following in the comic book world. Batman’s first appearance in 1939 following the creation of Superman, quickly saw the Dark Knight featured in his own comic series and the creation of several of his most famous arch-villains. To this day, Batman remains one of the most iconic and beloved comic book superheroes known to children. They love to role play as the caped crusader himself or play alongside as his trusty sidekick Robin. Batman fills a need for children to feel in control, especially when so little of their lives and choices are up to them. He can instill confidence and let your little one know that the good guys will always win in the end. We recently updated our list of the top 10 best Batman toys to include a new product and we also reviewed all existing product information to make sure all toys were still available and that their features and costs are still accurate and up to date. This transforming Batcave will stimulate young minds and has plenty of fun textures and gadgets to keep curious little hands occupied as well! Imaginative play is important for young minds as it allows them to explore empathy, story structure, characters, and creativity. This transforming Batcave will stimulate young minds and has plenty of fun textures and gadgets to keep curious little hands occupied as well! It folds up to store fairly compactly but can be expanded for lots of fun, creative play. The set has lots of kid-friendly functions that will excite them. They’re not likely to get bored of this one very quickly. Like a real bat, this DC Super Friends Batcave spreads its wings; turn the first of several power pads and watch the toy unfold and grow! The wings elongate, the platforms move out, and the Batcave becomes a sight to behold. Turning a second power pad opens the garage, and a third opens a chest piled full with Batman’s armor. 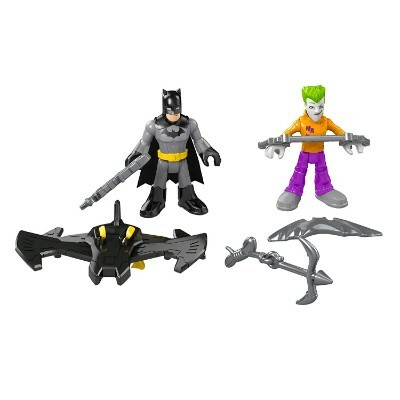 The set includes the fold-out Batcave, a Batman figurine, a Joker figurine, Bat-Armor, and a projectile launcher. With three different levels to fight on, this kit is jam-packed with fun for your little superhero. 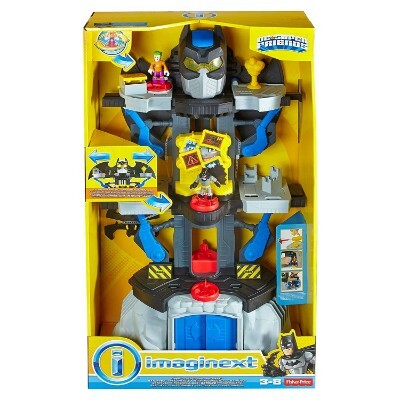 The product is most suitable for ages four to ten and requires two AAA batteries which are included. Hot Wheels reliability and a great big truck. Impressive to look at and a perfect gift for Monster truck lovers and Batman fans who want something different. A much larger Hot Wheels product than usual and an impressive monster truck. With a sturdy build and a great paint job, this monster truck is an intimidating competitor with all the flash and style a kid could hope for. This truck can hold up to punishing play, and its size makes it nearly impossible to lose. A favorite monster jam truck from the trusted Hot Wheels brand. This off-road Batman vehicle is just like its life-sized car-crushing inspiration with a lot of detail in the chassis and suspension to intimidate the competition. At 8” long and 5” tall this is a big truck for the brand but, the giant wheels and Bat Wing, and the bat black decorations with the iconic Batman logo on both doors make it a can’t miss presence at any monster jam gathering. 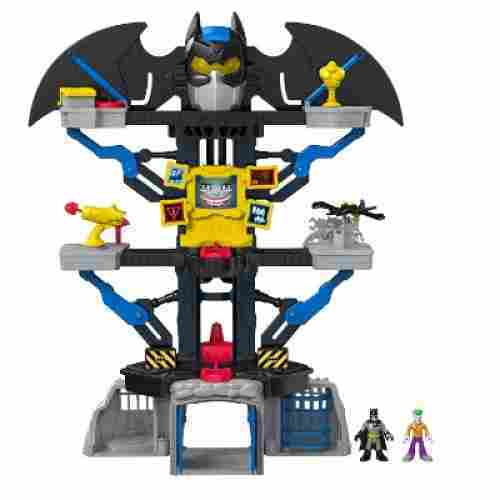 A great gift for monster jam truck collector, this is big fun for Batman fans. 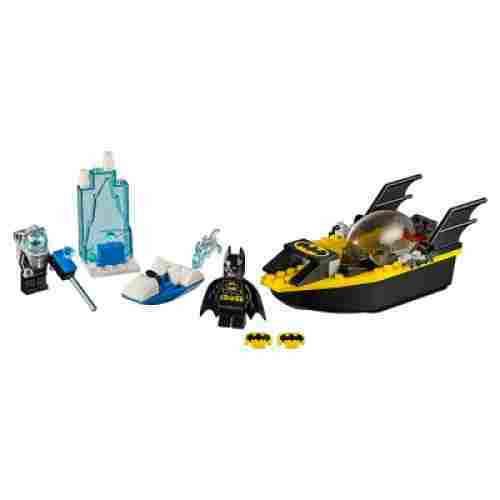 The figures fit and stand up in their respective boats, and the Batboat is one solid piece so it will float if you want to use it during bath time. The fact that it shoots discs is pretty impressive to most young ones as well. When your child finally reaches the denouement of their chase, they can lock Mr. 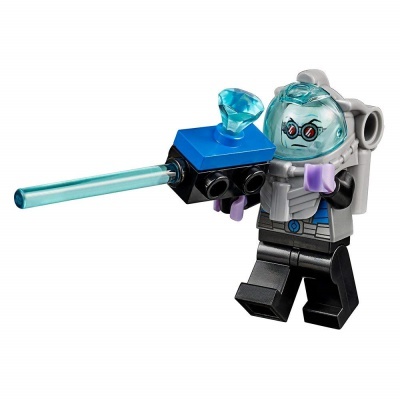 Freeze up in an ice prison complete with a tiny crystal, and tow his chilly water bike back to shore. 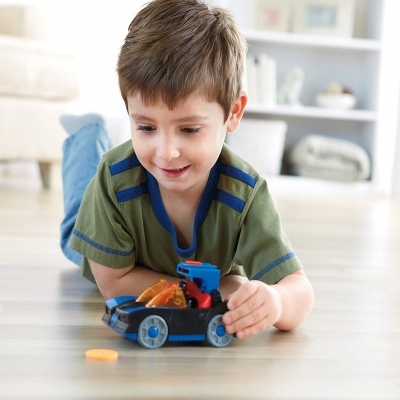 The set includes instructions and is best suited to children ages four to seven years old. Building-centric toys help children understand the logical thinking, instruction-following, and pattern recognition. 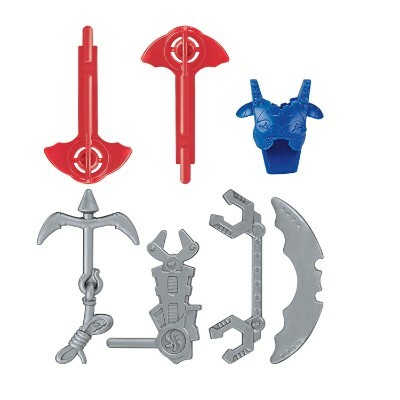 This set is specifically designed with slightly bigger pieces and easy-to-assemble blueprints so that they won’t get frustrated. They’ll have their set constructed and be engaged in the adventure in no time. 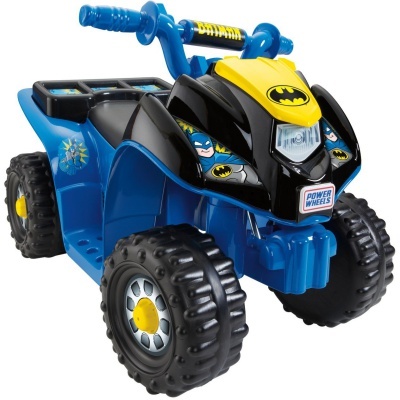 Give your little one the joy of riding their very own Batmobile-like quad this holiday! Between your child’s first and third year of life, they begin to learn how to act independently from their parents. 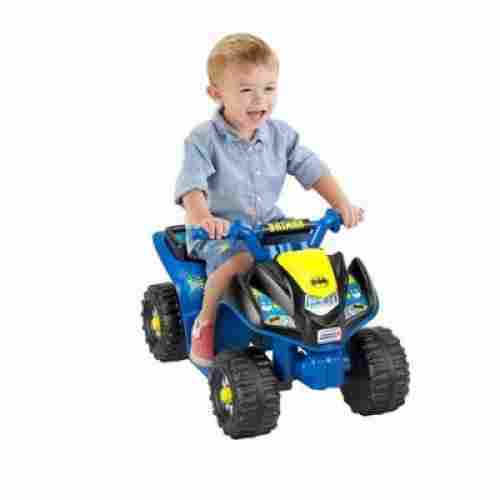 Toys such as this Lil’ Quad are an ideal way to help bolster your child’s budding self-confidence and independence by providing them with the means to control things on their own. 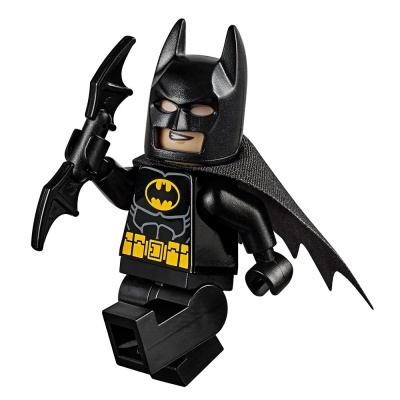 Pretend play and emulation also take a huge step up with cognitive development during this time and familiar character such as Batman can encourage your little one to explore their creativity, self-confidence, and imagination as they role-play. 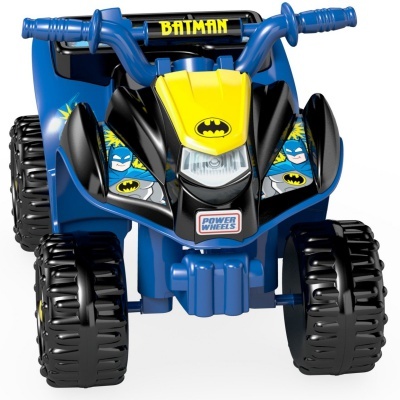 his delightful motorized four-wheeler features a bright blue Batman motif sure to thrill any fan of the Caped Crusader. It utilizes a push-button on-and-off switch that allows your child to have the full freedom to control their own movement on the quad. Don’t worry parents! The quad is only capable of moving forward and goes a toddler-friendly 2 miles per hour at max speed. Fast enough to thrill your big little kid and slow enough that they won’t get hurt from a tumble or fall. It also means that you can walk faster than they can drive, allowing you to quickly catch up to them in case of emergency. It uses wide tires with deep treads to propel it quickly and easily across most hard surfaces and grass while still being gentle enough to use indoors without scuffing the floor. Your little one will be ready for their next adventure with the Daring Duo in this Lil’ Quad! When our little ones start walking, it hard for us, as their parents, to want them to do anything else. We cherish every one of those toddling steps so much that we avoid many toys and aids that require them to sit down. Toys like the Power Wheel Lil’ Quad can actually help early or pre-walkers develop the confidence that they need to start moving and grooving on their own! It’s pocket-sized and easy to carry around, unlike the huge building top spotlight used by Commissioner Gordon. Kids can use it anywhere, day or night, for all to see. The Batman Projector Pen sends the bat signal into the sky to call the Dark Knight.Whether children need help in Gotham City or they want to signal friends for a meet up to play Batman, this projector pen will do the job with the classic bat icon enclosed in an oval of light. DC Comic’s Dark Knight Batman Projector Pen is perfect for Batman fans. Even if you’re just looking for a simple pen, it writes nicely and clearly. The Bat Signal projector gives it an extra benefit, that you can project from up to 3 feet away. It’s even visible in daylight. This makes doing homework almost fun (keyword: ALMOST). When they’re done with their schoolwork for the day and ready to gather their superfriends to play, they can flash the bat-signal to call everyone to assembly. Or, if they need help on one of their assignments, this is a great gimmick to flag down supermom or super dad. Creative play boosts confidence, social skills, and good ol’ fashioned fun. 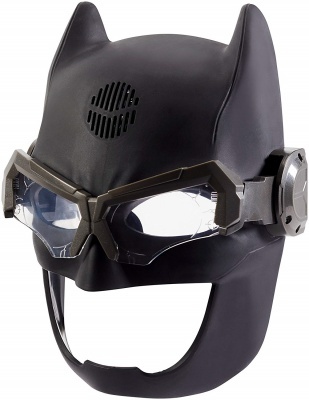 Cloak your child in Gotham’s shadows with this stylish tactical helmet. Creative play boosts confidence, social skills, and good ol’ fashioned fun. The voice changer on this helmet will have your child’s imagination whirring at the speed of the latest and greatest batmobile. If you and your family recently saw the Justice League movie, the DC-fever is likely high in your household. This fun tactical helmet will have Batman fans reeling. A vizor flips down to activate an eyelight which reads in an eerie, super blue color. The mask is open around the mouth to avoid any safety hazards. A voice changing effect allows your child to sound like the signature gruff-toned Batman. And you can switch the tactical helmet’s function to hear it play movie quotes and sound effects. It’s sturdy so it can survive some rough play with the young ones, but chic enough that older kids and adults will get a kick out of it, too. This is a great party trick for kids and adults alike. The voice changer will have everyone giggling together, and the flip-down, light-up goggles provide a cool effect, especially with all of the lights off. This mask is likely to be a riot for the whole family. 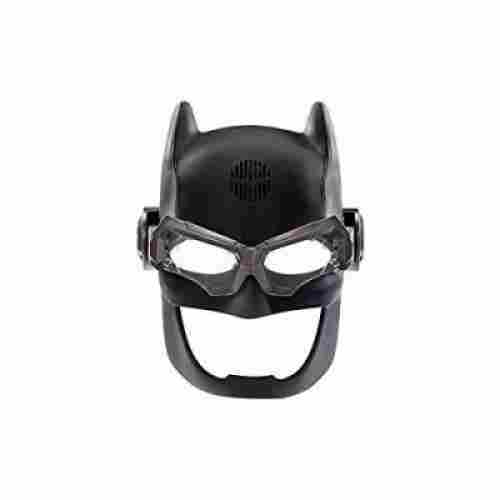 A plastic mask with an elastic strap that allows a child’s imagination to enter the world of the Caped Crusader and fight alongside all the DC comics characters. Simple is always best, and you’ll never need to change a battery. It’s hyper realistic and comfortable to wear. The fact that it’s only a half-mask means children can run around in it and still breathe easy. It will look great with any Batman costume or even just a cute set of Gotham-themed PJ’s. A Bat Mask to top off any Batman costume! This mask has the iconic ears and fits over the eyes with a nose guard that allows kids to breathe while protecting the tender nose in case a fight breaks out. It’s a plastic mask with an elastic strap that allows a child’s imagination to enter the world of the Caped Crusader and fight alongside all the DC comics characters. Simple is always best, and you’ll never need to change a battery. Regardless if your child is dressing up for a party or just really loves Batman, this will be a favorite. The mask is a close replica of Batman’s actual costume, minus a few details, making it enough for your child to enjoy being Batman. The comfortable padding around the eye holes, ensure that your child will be able to keep it on for a while. More than just a model car, this Batmobile has headlights and shoots bat disks. It’s also a two-seater that allows kids to chose which of their favorite superheroes will ride with the Bat today. Every new character lets children imagine new stories, tapping their creativity for more fun. Whether your Batman figurine rides with Robin, Joker, Green Lantern, Flash, or any other DC Super Friends character, they’re sure to have a fun time. 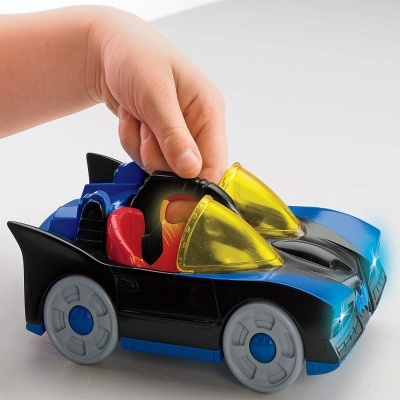 The two-seater car gives your child the capability of picking and choosing with two characters gets a ride in the Batmobile. This toy is great for imaginative play. Aside from a launcher that shoots bat disks, this Batmobile also lights up at a press of a button. Your kid will love sitting the Batman mini figure in the dual cockpit of the Futura. This should be a really unique gift to give this Christmas or even during your kid’s birthday celebration. With a launcher that really shoot bat disks, the Batmobile with Lights is one of the best Batman toys you can buy for any kid. It is designed after the 1960’s Lincoln Futura car that Batman and Robin used in their fight against crime and evildoers. It’s a nice blend of old and new with the Rock ‘Em Sock ‘Em concept design meeting the revamped DC Universe. The fact that they’re not in a ring means they may be a little less stable on their feet, but you can move them around and get creative during the boxing match. The set doesn’t include a full boxing ring like the original, but the stands are sturdy and easy to move around and travel with so you can set up the game wherever is most convenient. The young and the young-at-heart alike are bound to enjoy creative play and dueling with this fun throwback. It’s the nostalgic Rock ‘Em Sock ‘Em Robots we all love with a modern makeover. Inspired by the Batman vs. Superman Dawn of Justice movie, these two figures stand opposite each other while players utilize the two-thumbed mechanisms to make them duke it out. When one player proves victorious, their opponent’s figurine will fall off the platform. The free-ring style of the figures allows some creative play in addition to their purpose as superhero boxers. The two-thumbed stands are a great way to work basic motor skills and the beginnings of understanding cause and effect in games and controls. The projectile triggers and the Power Pad control are unusual and fun. Encourages new, ocean-going Batman adventures to imagine. A toy that really does something and no batteries necessary. 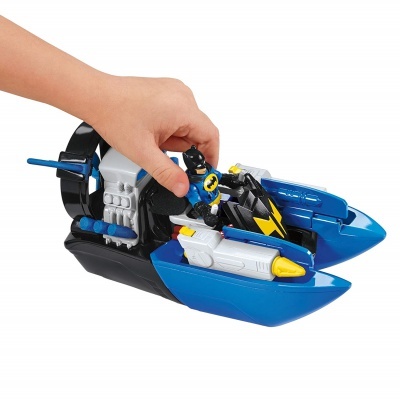 The Bat Boat takes the fun to the water and fires projectiles, and the fan motor spins to add even more excitement to Batman’s adventures. 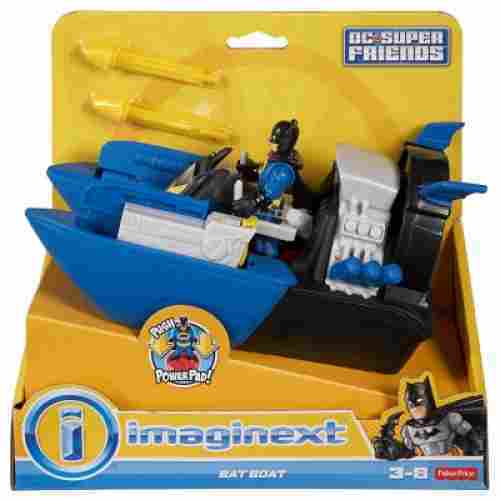 The Batman figure (included) can get out of the driver’s seat and is the right size to drive the boat. The DC Super Friends Bat Boat comes armed and ready for crime-fighting adventure. With 2 cannons and projectiles, the Bat Boat can speed ahead, tracking down the villains and blast them with the push of a button. The Power Pad can raise the cannons to change the range and trajectory of the projectiles, and the giant fan propeller spins as you push the Bat Boat back or forward. For this list, we knew that Batman was a popular figuree among comic book lovers. But aside from that, toys like the ones that are mentioned above are great for role-play and dramatic play. When children engage in either role or dramatic play, they take on the role of someone else. Your child then imitates the character's speech and actions into make-believe situations. If the role play happens in a group activity, it's referred to as sociodramatic play, as its social and imaginative. As your child lets their imagination lead the way into their play time, they are also likely to incorporate first-hand, real-life experience. It encourages them to act in an "as if" state. Though these situations are not likely to be reproduced, it does help your child to explore the actions and feelings of others. We also considered the credibility of the manufacturerr. Typically, we only include products from companies that have been in the business for many years. But, we also recognize the fact that there are new industry players that also deserve consideration. So, we had to quantify the credibility and reputation of these companies based on the feedback of customers. Negative comments are seriously evaluated whether these have bases or mere speculation. 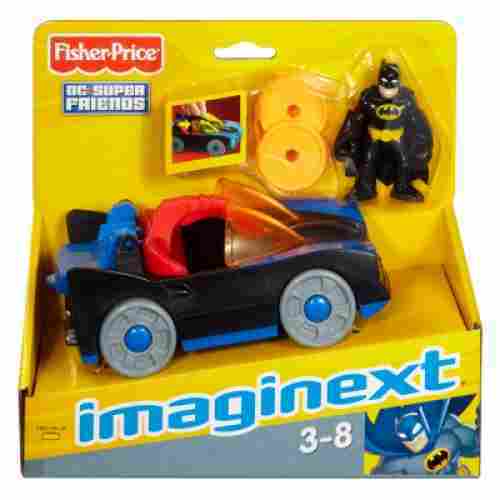 In choosing Batman toys and gizmos on our list, we had to look at the developmental benefits of these products. We had to make sure that these provide something useful to children, especially in enhancing their development and growth. And if it has educational value, then we had to carefully examine just how children can learn from the use of such items. There are many reasons why child development experts encourage role-playing in children. For us adults, we often look at role-playing as dramatization or the process of acting out parts in a particular story. What we often overlook are the processes that are involved in the assumption of a particular role especially by kids. When children role-play, they often base the different roles of the character they are portraying from ideas that are the sum total of all their previous life experiences including learning activities and sensory information. Their young brains have to recall from memory what they have learned about a particular character. For example, if they are going to pretend to be Batman, they are essentially trying to process everything they know about Batman. Does he fly like Superman? How strong is he? Can he beat other superheroes with supernatural powers? Is there really a need for a mask and a cape? Is it even possible to change or alter Batman’s costume? These questions are just some of the things children have to answer if they really want to portray Batman in a role-playing session. Now, understand that the way a young child thinks is totally different from that of an older child. Younger kids will typically have very limited imaginative capabilities simply because they also have limited information about the character they wish to portray. On the other hand, older children have very vivid imagination such that they can already think of 1,001 ways in which the role can be portrayed. For instance, they can start thinking of Batman as the alter ego of Superman who just happens to work in another city. This means that Batman should also be able to fly and breathe in outer space without the need for an oxygen breathing apparatus. They may even think that Batman can swim underwater like Aquaman or is the long-lost secret love interest of Wonder Woman or is actually the big brother of Robin or Nightwing. The point is that, as children grow older, they can form more varied assumptions of the roles that their character needs to show. However, as children become more mature, this imagination gets toned down to integrate realism. This means that when teenagers start role-playing, their actions are now based more on reality. They will now say that human flight is simply not possible so Batman cannot really fly. They begin to understand that it is entirely possible to perform the different stunts that the Caped Crusader executes. This sense of realism has its roots from continuous cognitive stimulation through the years. And this is essentially what role-playing can do for children. They may start out as naïve, innocent, and unknowing, only to end up fully capable of making the correct decisions based on their understanding of how the world actually operates in reality. It can, therefore, be said that role-playing activities help children master their ability to understand the things around them. This can become a crucial foundation for their cognitive abilities such as problem-solving, language and communication, memory recall and processing, logical and counterfactual reasoning, and creative and critical thinking. Role-playing does not only have a bearing on children’s cognition, but it can also play a significant part in their social and emotional development as well. When children play a certain role, they make use of their social skills in their portrayals. They begin to understand the value of interpersonal relationships and how maintaining these can lead to improved self-esteem as well as self-worth. These will allow them to feel more confident about themselves and help them persevere to be the best they can ever hope to be. q: Where can I purchase these toys? All the toys on our list can be purchased directly from Amazon. However, they are also available on other websites and stores. For the sole purpose of consistency, we’ve kept our links to one site. 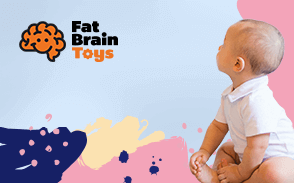 q: Are these toys suitable for kids of all ages? Most of these toys are safe for children of any age. However, there are some products that might contain smaller accessories or are generally harder for younger children to know how to operate. It’s best to read the safety features of the products you wish to order before purchasing them. The review section is also a great place to look for issues that other parents might have faced. q: Why are there different types of toys on this list? We wished to include a range of Batman-inspired products that your kid will love. Regardless of their likes and interests, they’re sure to find something to their liking on our vast list. q: How do I hunt for a bargain for these toys? The best advice that we can give about finding the best prices is to research thoroughly online. It can be hard sometimes to find the best pricing after you take into account the extra that will be taken for shipping and tax. However, if you research prices for both physical stores and online stores, you’re sure to find a great deal. Batman is a fictional comic book character that first appeared in Bob Kane and Bill Finger’s 1939 Detective Comics #27. As to why kids like his character, there can be various answers to that. The character has advanced technology skills, as well as superb deductive skills, extensive wealth, combat ability, and is an excellent martial artist. He is also the CEO of Wayne Enterprises, making him a good role model for young children. q: Why are his toys So popular? Batman has been an important figure in the DC comic book world for decades. As he first appeared, readers were quickly enthralled by his rise to success after his heartbreaking loss. It gave him a human aspect that young kids are able to relate to. This relatability allows readers to continue rooting him on. It also pushes them to want to be, or be like, Batman/Bruce Wayne. With the newer movies being released, kids also want to be a superhero.